Sandwiched between two little morsels known as Grand Theft Auto IV and Metal Gear Solid 4, Codemasters is either extremely bullish or extremely naive about Race Driver: GRID, a kind of spiritual successor to the good old TOCA series. Based purely on its critical reception – including a 9 from Edge in the same issue that MGS4 received an 8 – it has every reason to be the former, but we all know that things don’t always work that way. Despite these reviews, I have to admit that I wasn’t blown away with GRID’s demo a couple of weeks ago. On the positive side it ran like butter and was good fun online, but on the negative side I likened the handling to a slot car race, the muted colours and bloom lighting was like every next-gen graphical cliché in one place, and it wasn’t particularly fun to get wiped out on the first bend so that you have to sit out the entire race. Oh, and EBAY the EBAY product EBAY placement EBAY was EBAY a EBAY bit EBAY prominent. Now that I’ve played with the full game, though, I have to admit that the game’s better than I gave it credit for. This is what you’d get if Michael Bay made a racing game – a fast, fun, loud, slick, very pretty pure racing game. With the product placement down, it might even be made under a pseudonym. Demolition derbies, Le Mans 24 Hours (done in 24 minutes, with a full day/night cycle), street racing, drift racing, touge battles, stock car racing. Disciplines that have had whole games dedicated to them are found as single races here, and they’re all great fun. Despite the highly realistic damage model, thankfully tempered somewhat in single-player with Sands of Time-style ‘Flashbacks’, it’s the kind of arcade racing that I like. 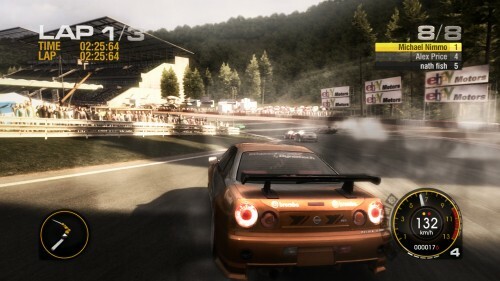 I hate anything that wants me to tweak gear ratios and punishes me for cutting a corner or driving aggressively, which is why I’ve always put the likes of PGR4 ahead of Gran Turismo and Forza, and this game is firmly in that camp. It’s about drifting perfectly around a corner on the inside of someone just as much as it is about hitting a wall at 150mph, spilling debris across the track, or having to race with the car veering wildly because its front wheel is hanging off. It’s fun, which sims aren’t. With self-important adventure games taking the headlines at the moment, here’s something to play when you don’t want to be thinking about the morality of war or the most effective way to decapitate a ninja. It’s a great way to spend an evening, online or not.